Joint trade fair appearance with Austrian distribution partner Bluetech Systems and labelling systems provider Schwinn & Partner (Stand C07 / Hall D). Datamax-O’Neil, a global provider of label and receipt printing solutions, will show its comprehensive product range at LOGISTIK Austria 2011 in Vienna (21 – 22 September). At the trade fair for logistics solutions, Datamax-O’Neil will share a stand with its Austrian partner Bluetech Systems Barcodesysteme, which specialises in distribution and customer services for barcode scanners, label printers and mobile data collection. Also to be present at the booth is the systems provider for labelling equipment Schwinn & Partner, which develops and manufactures dispenser and labelling systems as well as solutions for automation in the fields of identification and logistics. Datamax-O’Neil, exhibiting at Stand C07 in Hall D at Messe Wien, will showcase its latest printer solutions such as the E-Class Mark III desktop barcode printer, the RL4 portable 4-inch label printer, the robust printers of the MP Compact4 series and accessories such as IQWax, IQMid and IQRes thermal transfer ribbons. In addition, the company will inform visitors about the extended warranty and service provisions covering its entire portfolio of printers. Moreover, a Schwinn & Partner system for labelling pallets will be demonstrated at the trade fair. The system contains an integrated Datamax-O’Neil print module for marking items with latest data. Printers and accessories for transport & logistics: Among other products on show at LOGISTIK Austria, Datamax-O’Neil will be presenting the extremely rugged RL4 4-inch label printer. The compact design of the RL4 means it can be worn on a belt or mounted in vehicles and is therefore ideal for use in mobile applications in warehouses and transportation. The E-Class Mark III desktop barcode printer also contributes to simplifying logistics processes. With its high print quality and speed, the printer supports employees in a wide range of transport and logistics tasks. MP Compact4 series printers have a solid metal casing and are a practical solution for dispatch and warehousing applications as the printers can easily be installed on forklifts and picking vehicles. IQWax, IQMid and IQRes thermal transfer ribbons offer high quality printing even under difficult conditions and are compatible with all stationary printers from Datamax-O’Neil. The thermal transfer ribbons make it possible to print sharp images and are an innovative addition to the comprehensive range of accessories. With high temperature resistance, they are suitable for applications in transport and logistics. Datamax-O’Neil is a trusted global provider of stationary, portable and mobile label and receipt printing solution products that enable manufacturing and supply markets to capture the benefits of automated product identification and automated legal and financial transactions. Datamax-O’Neil is the barcode and mobile printing business group of Dover Corporation’s Product Identification Group (PIDG), a global platform entity with products and services covering all the leading marking technologies and applications. The company’s products address a wide variety of applications, including those in the industrial, healthcare, retail, automotive and ticketing market sectors. Datamax-O’Neil is headquartered in Orlando, Florida, and maintains key facilities in California, Illinois, and France, as well as sales and technical support offices around the world. The new reader has a list price of $1,695 for the four-port model, and $1,995 for the eight-port version. The device measures approximately 7 and 3/16 inches by 9 and 5/8 inches—about one-third smaller than its XR series counterparts. Retailers now have access to the combined advantages of RFID and conventional EAS tags, without having to modify their existing EAS installation. The product is ideal for multi-brand shops, in-shop inventory use or for the whole supply chain from the distribution centre to the point-of-sale. The smartPIN RFID tag can easily be added to existing EAS tag systems – as easily as an existing EAS system can be extended with smartPIN RFID. “Adding a smartPIN RFID tag to an EAS installation requires no changes to the EAS system. There’s also no degradation in EAS tag performance. Several retailers have been appraising the product and we’ve started volume supplies this year to big brand names,” says Péter Perecz, sales manager, QID Solutions Ltd.
“QID’s smartPIN is truly a revolutionary product in its compliancy with the existing EAS market. Retailers can achieve the benefits of RFID simply by adding smartPINs in place of dummy pins. Shop inventory using RFID readers and smartPINs attached to apparel, for instance, is much faster than traditional barcode-based inventory. Moreover, you don’t lose the code from the item that easily,” says Mikko Nikkanen, business development director, UPM RFID. Security startup Verayo has named former Apple security architect David M’Raihi as its new chief technology officer and vice president of engineering. It’s pretty rare for high-ranking Apple employees to leave the company for a startup. So the move shows that Verayo, which makes a clever security and authentication technology, has an interesting future in the security and authentication business. We’ve followed Verayo closely for a couple of years and its security solutions are becoming more and more relevant, given the ongoing collapse of security systems in the face of determined hacker attacks. As a respected security expert, M’Raihi is well-suited to advance the application of Verayo’s “physical unclonable functions” (PUF) technology — which allows for secure verification of someone’s identity — into mobile and other connected devices. He replaces Srini Devadas, inventor of the PUF technology at MIT and former CTO of Verayo. Devadas becomes chief scientist. The move is the second major change for the company’s executive ranks. In April, former PayPal general manager Eric Duprat replaced Anant Agrawal as CEO. Agrawal remains an advisor to the company. Before joining Verayo, M’Raihi was analyst and architect of mobile, portal devices and digital content distribution at Apple. He also held senior executive positions at authentication firm VeriSign. The PUF solution is a result of the clever use of inexpensive technologies. San Jose, Calif.-based Verayo makes “unclonable RFIDs” or radio frequency identification tags, which are akin to the security badges that employees use to open doors. One of the great problems of the chip industry is that no two chips are alike. Even when chip makers are fabricating the exact same chip product, like an Intel microprocessor, there are always minute and virtually unnoticeable differences from one chip to the next. The brilliant thing about chip startup Verayo is that it has figured out how to turn this flaw into an advantage. It uses the minute variations in chips to uniquely identify each one. In turn, it uses this identification method to create ID tags that are secure and can’t be cloned. Former CEO Agrawal called this “silicon biometrics,” akin to fingerprint identification. The technology was dreamed up by Devadas, an electrical engineering and computer science professor at the Massachusetts Institute of Technology. Devadas started the company in 2005 and developed the technology for two years with funding from the U.S. government. If you send an electrical signal into a chip, you will get a unique response because every chip has different PUFs. The good thing about these PUFs is they are cheap; they are tiny circuits that add virtually no cost to a chip. The technology fits well with basic tests for authenticating products. You can give a chip 50 different challenges that produce 50 different responses. You store the responses on a server. Then you put the chip into a radio identification tag (RFID) that can be attached to a retail product as if it were a bar code. When someone buys that product, a reader at the cash register will read the serial number on the tag. The reader then sends the serial number back to the centralized computer in a data center. That server will look up the serial number in its database and send one of the 50 challenges associated with that specific chip. The reader receives the challenge and it prompts a response from the chip in the tag. That response goes back to the server. If it’s a match, then the chip is verified as authentic. Here’s a video description of Verayo’s technology. Verayo has succeeded in getting various customer trials and is now working on mass producing its chips. But the chips aren’t that useful if there are no readers to read them. The company struck a deal with Denver-based SkyeTek, which makes low-cost RFID readers and software that performs the authentication functions required in Verayo’s chips. SkyeTek’s RFID readers come in a pen-size form called a Pentesta, for consumers to carry in their pockets. Consumers can pull out the half-inch-thick, battery-powered readers and use them when they’re about to buy drugs at a store. A tray-sized reader, dubbed the Trayesta, lets pharmacies test a bunch of drugs before they sell them to consumers. When the PUF authentication verifies a product, the test devices display a green light. If it’s fake, it displays a red light. The pens currently cost around $50, and SkyeTek is working on driving costs lower. Verayo’s rivals include NXP. Verayo has raised an estimated $6 million to $7 million from Khosla Ventures, and it has revenue from the Pentagon. Radio Frequency Identification (RFID) is a method used to automatically identify and track things using radio waves. It is a two-component system that consists of an identifying tag (or transponder), and a device capable of reading the tag (reader). RFID tags can be applied to any object, including products, animals, or even people, from a given distance. Because RFID relies on radio waves in order to work, the tag can be anywhere from a few inches to somewhere beyond the line of sight of the reader. Based on a number of devices invented during WWII, and refined from a transponder device patented in 1973, modern RFID technology has become a part of our daily lives. Data stored on the RFID tag can range from something as simple as a serial number to several pages of data. An RFID tag consists of a low power integrated circuit (or microchip) connected to an antenna made from either a copper or aluminum foil that is adhered to an object. Future RFID tags may be chipless designs printed directly onto objects. Readers pick up and decode the data broadcast by RFID tags when powered. There are two ways to power RFID: through radio waves originating from the reader (passive RFID), or with a battery (active RFID). Passive RFIDs are readable at a distance of between four inches and 33 feet (11 centimeters to 10 meters) and have an infinite range of applications, while active RFID tags have a range of several hundred feet and are best suited for specialized applications. Both work in three radio frequency ranges (30-300 KHz, 3-30 MHz and 300 MHz to 3 GHz), based on how they are used. The U.S. government actively employs RFID technology in a variety of ways. For example, the U.S. Department of Homeland Security (DHS) and U.S. Department of State (DOS) use RFID tags to store biometric information in passports and Trusted Traveler Program documents. For security purposes, RFID tags used in these types of applications do not contain personal identification information, but rather a number pointing to a record in a secure database. Other uses of RFID tags include tracking military supplies, nuclear waste, and other sensitive or critical items. In the United States, other common uses for RFID tags include inventory control, merchandise tracking, toll or fare collection, and document verification. RFID is also gaining acceptance in the healthcare industry, which uses it for patient and medication tracking. Also, pet owners often have implantable RFID tags placed in dogs and cats (also known as chipping or microchipping) for identification purposes should they get lost (information on this practice is available from your veterinarian). On Sunset Boulevard, in Hollywood, California, film producers need video, sound, lighting, and production equipment. They rent it from Indie Rentals. The company’s tagline is “Dream it, Shoot it,” and they are experts at providing the highest quality production equipment for filmmakers. Everyone at Indie Rentals has worked on set in the film industry, so they know the rigors and requirements faced by their customers. To ensure that the right equipment left the store with the right customer, Indie Rentals installed a NOX Vault Surveillance system from SimplyRFID. With the NOX system, Indie Rentals placed ThingMagic Astra RFID readers at strategic locations throughout the warehouse. Additionally, IndieRentals purchased a NOX Vault handheld reader for check in and check out inventory operations. Now, when a customer checks out equipment, the handheld reader allows Indie Rental’s customer database to be immediately updated. This “unlocks” the equipment, allowing it to go through the ThingMagic readers installed above the doors without setting off alarms. Using SimplyRFID’s NOX Core server software, and ThingMagic’s Astra reader, IndieRentals now has a constantly correct inventory control database. It is no longer necessary to shut down operations for a physical count. The NOX handheld and the ThingMagic readers survey the entire shop in seconds. Sitting at a desk, IndieRentals employees are able to survey the entire operation. ThingMagic, a division of Trimble, is a leading provider of UHF RFID reader engines, development platforms and design services for a wide range of applications. ThingMagic develops products for demanding high-volume applications and provides consulting and design services to create solutions for challenging applications. ThingMagic’s customers include some of the world’s largest industrial automation firms, manufacturers, automotive companies, retailers, and consumer companies. Located in Cambridge, Massachusetts, the ThingMagic business was founded in 2000 by a group of visionary PhD graduates from Massachusetts Institute of Technology’s Media Lab. ThingMagic is “The Engine in RFID™”. The bar code industry is continuing to grow and change. However, a good many of the top players are well established companies and we thought we’d do a quick review. RFID and Auto ID News: Are RFID Tagged Humans Closer than we Think? Are Technologist’s Experiments Idle Fun, or Leading Indicator of Coming Big Brother Era? For more than two decades, there have been concerns about the potential use of auto ID technologies to track humans, ranging from those raising serious concerns to more fringe elements predicting the apocalypse. In the early days of bar coding in the late 1980s and early 1990s, it was not uncommon to emerge from one of the then trade shows focused on the technology to find flyers under car wiper blades with a picture of a man with a bar code tattooed on his forehead, with bold headlines about the “mark of the devil” or something similar. Now, some 2000 humans, and millions of animals, have RFID chips embedded under their skin. Amal Graafstra is a “technologist” on the US West coast that has taken the plunge – and talked his girlfriend into the procedure as well. He has an RFID chip implanted in each of his hands, allowing him keyless access to his and his girlfriend’s homes, and to automatically turn on electronic devices and who knows what else down the road. “When I open my front door, I don’t reach for a key. When I log into my computer, I don’t touch my keyboard. When I start my motorcycle, again, no key needed. Instead, I just wave my hand and I’m in business,” Graafstra recently wrote in an article for IEEE’s Spectrum magazine. What started Graafstra on this strange journey? He says it started in 2005 when he was managing computer servers for medical facilities around Seattle, a job which required him to carry ring of keys to almost 100 different doors and drawers. What best to solve this or related problems? Graafstra consider biometrics, such as fingerprints or retinal scans, but found the technology unreliable or too expensive. That turns his attention to RFID, where he learned that some 20 million RFID rags had already been implanted in dogs, cats and other domestic animals for tracking and identification purpose, not including the millions more used with livestock (usually not implanted). Graafstra did not want to use one of these pet tags, though they were designed for implantation, because they require registration with some type of central database. It took a while, but Graafstra eventually found a glass encased, passive UHF tag about the size of a grain of rice (from Philips) that, while not approved for implantation, seemed like a potentially good fit. It had advanced encryption, for example, one of Graafstra’s important criteria. He even experimented with a few light hammer hits to test the transponder’s ruggedness, and found it took quite a wallop to shatter the tag. Not long after, after signing a waiver, he found a doctor who was willing to first sterilize the tags, make incisions, and put the transponders in each of Graafstra’s hands, as X-Ray photos show below. After the small incision, the tag is implanted using s syringe loaded with the chip. Of course, to solve the original lock problem, there is no need to have RFID tags embedded under the skin, Key fobs, ID cads or similar media are already in widespread use for security type applications. Buying a series of relatively low cost UHF readers, soon Graafstra was controlling access to a variety of things around his home by simply waiving on hand or the other in front of a reader. He later installed an RFID access system to allow him to enter his girlfriend’s home in the same manner – which ultimately, if initially reluctantly, led her to have RFID tags implanted in her hands as well. The read range is 5-7 centimeters, he says. The couple that RFIDs together stays together, we have heard. It turns out there is already a commercial company focused on human implantable RFID chips for a variety of applications. VeriChip, offers systems where implanted people can pay for drinks and gain access to VIP rooms in clubs using their implant and other kinds of similar programs. It has some success with the concept in certain areas of the globe, but nothing so far in the US. It also offers implantable chips for medical records purposes, such communicating that an unconscious accident victim has diabetes or a heart condition. Of course, privacy concerns come in to play, and Graafsta says he received hundreds of often scathing emails accusing him of helping to enable a “Big Brother” society where humans are tracked by the government night and day. But Graafstra himself says that his journey with RFID is at least voluntary, whereas in London and soon other cities nearly the entire urban area is under video surveillance – and facial recognition technology is being widely deployed to identify humans as needed. What’s your reaction to Graafstra’s RFID hands? Is this just a gimmick, or do you think many other may make such a move? Is this a path the Big Brother? Let us know your thoughts at the Feedback button below. Filed in Uncategorized | Permalink | Comments Off on RFID and Auto ID News: Are RFID Tagged Humans Closer than we Think? The On-Demand supply chain software world is really coming. I must admit I have been until recently a bit of a skeptic. Why? Well, many of the early On-Demand solutions simply were not that robust in terms of functionality. Second, I wasn’t convinced that in many cases that the economics made sense – why pay for something forever when you can pay for it once? Third, in many cases, especially with Transportation Management Systems (TMS), I have seen a tendency for implementations to be “dumbed down,” for a number of reasons, simply meaning they tended to be much less ambitious than traditional deployments. But I am changing my tune. In my 10 predictions for Supply Chain 2015 late last year, I had as one of them that On-Demand Supply Chain software would come to dominate the market by that time, and in subsequent presentations I have given on the 2015 supply chain, I have told audiences that I am as confident in that prediction as I am any of the other nine on my list. That doesn’t mean the thousands of traditionally deployed software applications are going to go away any time soon, but it does mean the preponderance of new software implementations by that time will be of the on-demand variety – and that this will have a profound impact on technology vendors and their customers. Increasingly, you will be able to try the software before you buy it! What a dramatic, game changing impact that will have. First, as I have in the past, let me note that there are several dimensions to “On-Demand,” and that many companies don’t always well think this through. The classic “On-Demand” model means that someone else physically hosts the application, and that rather than buying the software upfront, as has historically been done, the software is paid for through some kind of transaction and/or subscription fees. Conversely, traditional software meant paying for the license upfront, and having it installed on a server within the four walls of the enterprise and managing that system yourself. But there are permutations, such as potentially installing the software within your enterprise, but paying for it on a transaction/subscription basis, or buying it upfront, but having some other party host the application for you. The key point is that you have to think through what you are really trying to achieve. You can add to that decisions about who is really going to run the software; for example, it is common in TMS selections processes for 3PLs to be also bidding along with software vendors for the business and saying they will not only provide the TMS (usually one of the ones also being separately bid) but manage some or all of the transportation process as well. This last point is actually important, because I believe that it is inevitable that the combination of the On-Demand model and the mega-trend towards outsourcing will increasingly lead to on-demand software vendors and/or their partners offering both a solution and a managed service, or what is often called Business Process Outsourcing. The line between supply chain software and services will become increasingly blurred. Which brings up all the terms, and there are a bunch of them here: Hosted, On-Demand, Software as a Service (SaaS), Cloud Computing, each somehow connected to this new approach to software delivery. Do the terms matter? A bit. SaaS is often said to imply “multi-tenancy” (as in a tenant), meaning multiple companies are running on one “instance” of the software. That can significantly reduce management costs, which can lower prices for users. Of course, getting an application to securely support running perhaps dozens of different companies with their own database, configurations, etc, on one piece of software is a challenging technical feat – which is in part why the On-Demand model has been slow to come. “Cloud Computing,” while very techie sounding, will also be important. The basic idea is that a software provider or hoster will have a farm of servers, each of which can be called on to provide processing power to a given application. In short, what that means is that rather than needing to acquire an expensive server that will easily meet your peak processing requirements but be well underutilized most of the time, you can tap into the power of the farm as needed, and just pay for that. As we note in the Letter, it’s similar to installing a sorter in a distribution center that is scaled for peak days but is well underutilized most of the year. What if you could install a much smaller sorter that meets baseline needs, and have it magically expand just on heavy days? You would save a lot of money, and that in a sense is what Cloud Computing can offer on the hardware side. I believe that On-Demand supply chain software is becoming a disruptive technology. Current vendors from ERP to planning to execution will be effected differently; some will make a good transition and thrive, while others will find themselves under assault from a new wave of On-Demand vendors built with that model from the get-go. Why do I think the On-Demand model will take over? For one, it’s the Google generation moving up the management ranks. Everything else they access will increasingly be coming from an on-line provider – why should enterprise apps be any different? Second, in the end, it is a better financial model for vendors. In the Great Recession, it was a lot better to be receiving a steady stream of subscription or transaction revenues, even if down some 20%, than having a tough time selling any new licenses for several quarters. The challenge comes in the transition, from the software vendor’s basic financial model to how sale people are compensated. But here is the bottom line truth: once the traditional providers make their On-Demand offerings what they lead with, rather than as the fall back offering as is generally true today, then the percent of On-Demand sales for new deployments will take off like a rocket. That day is not too far away. Think of some of the other changes we will see. Increasingly, you will be able to try the software before you buy it! What a dramatic, game changing impact that will have. No more trying to guess what the software really does through mind-numbing RFPs and software demos, but by accessing a version of the software on-line and seeing for yourself. It will certainly put the buyer in more control. Of course, there are pros and cons as with everything, and today, you need to consider lots of factors. We cover that and more in the Letter, and on Monday on the Resources page will have a Total Cost of Ownership calculator that will allow you to compare On-Demand versus traditional solutions. The ability or lack thereof to build competitive advantage through a unique software solution is certainly one concern that has to be considered. BaxTek Solutions can help guide your company into the right direction and ensure a brighter future. Officials at the Food and Drug Administration believe the public health risk is low, and no one is known to have fallen ill as a result of the contamination, but, manufacturers voluntarily recalled 56 products last week, and that number is expected to balloon in the coming weeks into what could be one of the largest food recalls in U.S. history. Michael Hansen, senior scientist at Consumers Union says over 10,000 products eventually could be affected. FDA says thousands of types of processed foods, including many varieties of soups, chips, frozen dinners, hot dogs and salad dressings, may pose a health threat because they contain a flavor enhancer that could be contaminated with salmonella. Salmonella was detected early last month in one lot of the flavor enhancer hydrolyzed vegetable protein, or HVP made by Basic Food Flavors, as well as inside the company’s Nevada manufacturing facility. The company is one of only a handful that make HVP. The additive is mixed into foods to give them a meaty or savory flavor. It’s similar to monosodium glutamate, or MSG. The contamination is believed to date to September 2009, meaning millions of pounds of potentially tainted HPV, all of which the company has recalled, was shipped in bulk to foodmakers over five months. Federal officials say the public health threat is low because most products containing HVP are cooked during processing or carry cooking instructions for consumers, so any salmonella would be destroyed before the food was eaten. Ready-to-eat products, such as chips and other snack foods, would carry greater risks. In response to the FDA investigation, Senator Tom Harkin, D-Iowa, said consumers should not have to think twice about the safety of a food item when they reach into their pantry. According to Harkin, our nation’s food safety system is outdated, lacks proper resources and, quite simply, does not adequately protect American consumers, and Congress cannot wait any longer to pass comprehensive food safety legislation. On November 18, 2009 the Senate Health, Education, Labor and Pensions Committee reported out S. 510, the FDA Food Safety Modernization Act. A similar bill is awaiting action in the House. Harkin, who is chairman of the Senate committee, says he hopes to have a comprehensive food safety bill on the President’s desk in the very near future. Last December, in a submission to the FDA, Mr.Greg Fritz, Vice President of Produce Packaging, Inc. of Cleveland, Ohio referred to the PTI as a “boondoggle”. The list of those who agree with Mr. Fritz is growing. Every one can agree that our food chain has become extremely complex. Today, we depend on a long chain of distribution to provide us our food. Most of us – as good consumers – don’t give this long journey a second thought. We blithely walk into our local gorcery store on a weekly, daily, or spot-puchase basis and fill our carts with the food we intend to feed our families. Very few of us stop to consider that nearly 1 in 4 Americans is sickened by the food they eat every year. What kind of track record is that? How successful would a CPA be if 1 in 4 of their clients were subjected to a tax audit? In response to concerns over the safety of our food supply, United Fresh Produce Association, Produce Marketing Association the Canadian Produce Marketing Association conferred to develop a solution for the produce industry, the Produce Traceability Initiative, or PTI. PTI’s main focus is to “to help the industry mazimize the effectiveness of current traceback procedures, while developing a standardized industry approach to enhance the speed and efficiency of traceability systems for the future.” The vision for PTI is to have every case of produce labeled for chain-wide adoption of electronic traceability by 2012. Sounds like an admirable plan. But are they getting sufficient “buy in” from their own industry? PMA conducted a survey recenlty asking for feedback on the PTI from “all industry members involved in the produce supply chain, from grower to retail and foodservice.” That’s a lot of players. PMA membership is reported at about 7,000. But because the survey was addressed to “all industry members”, I did a quick search of fruit and vegetable growers/producers in the US; the list was just under16,000. Add brokers, packers, markets, grocers, and you can imagine how this number would increase. From this list of potentially-interested participants in the produce supply chain, PMA received…. (wait for it)…. less than 300 responses. Not encouraging. Even if we were only to consider PMA’s membership, the rate of response is less than 4.3%. If the produce industry isn’t on board for PTI, how can they hope to make it relevant to consumers? And shouldn’t that be a huge factor? Much of the concern of and hesitation to adopting PTI for most members of the produce supply chain has to do with the cost of implementation. In general the industry believes that adequate internal traceability all ready exists; that it’s more a matter of the FDA wanting one single format/report in the event of a recall. There is always a price associated with the integration of new technology into an existing process, so the question becomes, “where is the best place to spend this money”? And regardless of the answer, will the consumer be willing to absorb any of the additional costs associated therein? Consumersunion.org conducted a poll that reported: 73% of of those polled regard the overall food uspply as safe; 48% said their confidence in the safety of the nation’s food supply has decreased; only 54% think enough is being done to ensure food safety and 83% are concerned with harmful bacteria or chemicals in food. Other polls reveal that most consumers would be more for safer foods. It would seem that on the surface, the answer to the added cost question is yes. I think the answer lays somewhere in the middle. PTI won’t necessarily improve traceability per se, but rather, standardize the format in which the information is communicated throughout the food supply chain. Between the mandates of PTI and the legislation currently before the 2 houses of Congress, the requirements seem overly-zealous to the point of being draconian. More should be done in terms of preventing the root causes of contamination prior to assuming a “one-size-fits-all” solution is the answer. I do believe that there are added efficiencies to be had through the increased use of technology in the food chain. The payoff, literally, comes in finding that balance…. IBM is soon to release its’ new iPhone App, Breadcrumbs, which will provide consumers with information on the food products they buy, including a list of ingredients, when the food product was manufactured and any related recall information. Is that going to be enough to interest the average consumer? What about safety standards and compliance? At minimum, PTI requires the name of the manufacturer (think “in-store” brands… Wal-mart does not manufacture their “Great Value” food products), address & phone number of the facility, commodity ID, net contents and country of origin labeling. What about images of the manufacturing facility? Take this image of one location of Peanut Corporation of America. 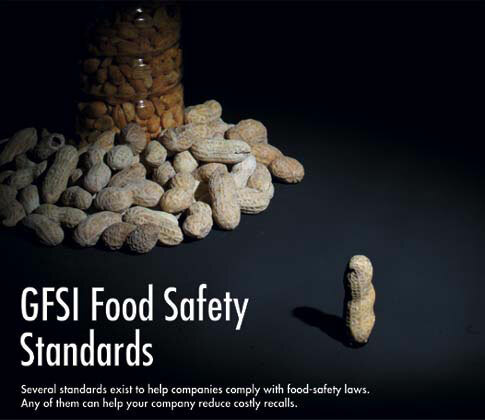 You’ll recall that PCA was the source of the peanut salmonella outbreak that led to the illness of hundreds and billions of dollars in damages throughout the food chain. What is your first impression? Do you think this facility looks especially clean, sterile, innocuous? It looks pretty shabby to me. And then let’s consider factory-farmed animals – chicken for example. If you knew the packaged chicken you bought from your local grocer was most likely produced in the conditions depicted below, wouldn’t you think twice about buying that brand? I have seen plenty of chicken farms and have learned that not only are free-range chicken healthier, the meat tastes so much better as well. The same could be said for beef, pork, & lamb. So to what information would you, as a consumer, want access when choosing the food that will go in to your mouth? Join the discussion @ LinkedIn under the Smarter Food Supply Group. Feel free to e-mail me at tina@baxtek.com with your thoughts and suggestions. I will post the responses next week. I’m looking forward to your input! Today at the IBM Information on Demand event, IBM will demo a new app that will bring the Internet of Things to the iPhone. The as yet unreleased iPhone app is called Breadcrumbs and it will give consumers access to information about grocery food items. The app will be able to scan barcodes and deliver a summary of the ingredients in a food item, along with when it was manufactured. That data is usually on the food label, but Breadcrumbs goes a step further – it can provide extra information such as product recall data. If a product has been recalled in the past, this app will tell the consumer all of the relevant details. Breadcrumbs is able to scan barcodes using the iPhone’s camera. The consumer simply points their iPhone at a food item and gets back relevant data. Other than product recall details, the information returned to the user is mostly the same as what’s on food labels – only it is pulled from the Web. IBM told ReadWriteWeb that when 4G becomes common place in mobile phones, then apps such as Breadcrumbs will become more powerful and be readily used on-the-fly by consumers when grocery shopping. The larger trend here is the convergence of smart phones with the Internet of Things (i.e. Internet-connected real world objects). Devices such as the iPhone essentially become sensor and RFID readers, which allow consumers to interact with real world objects in a much more detailed manner. Breadcrumbs is a glimpse of what we’ll see in the near future, when information will literally – finally – be at the consumer’s fingertips when they’re shopping for groceries or any other goods where data is plentiful. Up till now, data such as product recall information has largely been inaccessible to consumers – at least when at the grocery store. In the long term expect to see apps like Breadcrumbs provide data on where and when food items get consumed, together with how long they were on the shelf before being consumed. Apps like Breadcrumbs may even be able to tell who consumed the items (privacy advocates, start your engines!). These apps will also be useful in determining counterfeit items, for example when buying an expensive luxury good. The date that Breadcrumbs will be launched on iPhone has not yet been announced by IBM. Federal investigators announced the expansion of a salami recall this week, to include another 115,000 pounds of meat that is believed to be contaminated with Salmonella Montevideo. At least 230 people have already reported suffering salmonella food poisoning in connection with the tainted salami. The USDA Food Safety and Inspection Service (FSIS) announced on Tuesday that inspectors have found contamination in more unopened salami products manufactured by Daniele International, Inc. The company originally issued a pepper-coated salami recall on January 23, for approximately 1.24 million pounds of salami and other italian sausage products. The latest expansion of the recall includes another 115,000 pounds of salami and sausage products rolled in mozzarella cheese. The products were sold in 8-ounce packages under the Daniele, Dietz & Watson, and Boar’s Head labels. A complete list of the products affected by the salami recall expansion can be found in the FSIS press release. According to an FDA update on the ongoing investigation into the Salmonella Montevideo outbreak, the U.S. Centers for Disease Control and Prevention have confirmed that at least 230 people in 44 states, and the District of Columbia, have fallen ill from food poisoning. Salmonella Montevideo infection can cause symptoms such as abdominal cramps, nausea, vomiting, bloody diarrhea and fever. While symptoms tend to resolve within a few days or weeks for most healthy adults, the elderly, young children and those with weakened immune systems may be more susceptible to severe, and potentially life-threatening, infections. The FDA has said that Rhode Island health inspectors found packages of black pepper in the Daniele processing plant to be tainted with the same strain of salmonella responsible for the illnesses, however the FDA has been unable to confirm that the pepper is the source of the outbreak. The suppliers of the black pepper have voluntarily placed their product on hold while the investigation continues. When choosing a systems integrator, it is essential that the correct mix of hardware and software vendors are carefully chosen to create the best solution. BaxTek Solutions takes the complexity of integrating these products and makes it so that the customer has a solution that is easy to deploy and use. In most cases, a single off-the shelf – or “plug-and-play” – solution will not fulfill all of a customer’s needs- The customer is then left to tackle the problem of complexity. BaxTek Solutions has constructed a total solutions package, www.baxtek.com/software/traceability/index.php?home, enabling food producers, processors and retailers to bring their current traceability efforts to the next level while simultaneously making a profit center out of what was once a cost center. BaxTek Solutions participates in the design of the project, the integration of legacy systems, implementation of the new applications, and remote management of devices deployed into the field. Choosing BaxTek Solutions provides the most efficient use of time and money for “Track and Trace” implementation. BaxTek Solutions represents all major Auto ID hardware manufactures (including LXE, Zebra, Motorola, Datamax, Intermec, Vocollect, Alien, Cisco, Unitech, Datalogic, Honeywell, and Sato.) Software solutions include Enterprise Resource Planning (ERP), Warehouse Management Systems (WMS), asset tracking, inventory tracking, custom, and mobile applications such as, DSD (direct store delivery) and field service. BaxTek Solutions’ diverse customer base includes manufacturers, distributors, as well as firms involved in logistics, mobility, and government projects. BaxTek Solutions’ team of project managers and engineers take a partnership approach to every project, achieving a rapid return on investment for clients. laws. Any of them can help your company reduce costly recalls. safety standards have been well accepted in Europe for quite some time. ensure consumer protection, and to strengthen consumer confidence. an independent global food business network headquartered in Paris. business. CIES shares best practices throughout 150 countries. involved in certification or accreditation activities. processes of a food safety management system. (NBE HACCP) Option B, and the Safe Quality Food (SQF) 2000 Code. process, and may soon be recognized. adopted by more than 8,000 food businesses in more than 80 countries. internationally recognized accreditation bodies licensed by SQFI. management, prerequisite programs, and HACCP principles. supply chain, and control of food safety hazards. 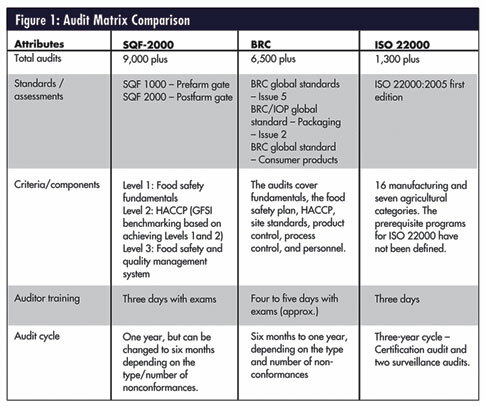 surveillance audits in the next two years. day-to-day and in times of crises. additional evaluation can be undertaken, if required. much more of a requirement than a choice in today’s marketplace. maintain a healthy food marketplace. incident or emergency situation that would require proper reaction. If you sell products to a distributor or a retailer, those products may need a UPC bar code that represents a “Global Trade Item Number (GTIN). All retailers doing scanning of merchandise at the checkout counter will require you to bar code label any merchandise you want them to carry. Before you can label your merchandise, you must get a unique UCC Company Prefix from the single authority, the GS1 US (formerly the Uniform Code Council) that exclusively controls the assignment of numbers. When you get a number, you will also get a certificate from that body authenticating your number; most retailers will demand proof of the certificate to verify that your number is unique and authorized. What if I just want to do a simple inventory? If you do not plan to sell the products that you want to bar code to retailers for resale, and you simply want them bar coded for internal use (like inventory, or tracking) then you DO NOT need to get a number from the GS1 US. For this application, you can use any numbering system you like, and any bar code type you want. UPC bar codes are not required – you can use Code 39 or Code 128, (or any bar code type for that matter) which are much more flexible. Now that I know I need a UCC Company prefix, where do I get it? In order to get a UCC Company Prefix, you must apply for membership to the GS1 US (formerly the Uniform Code Council). There is a fee for membership and it is based upon the information you provide about your company on the on-line application. Two of the key factors that are considered are sales volume/revenue and numbering capacity needs. You can apply online, by phone, or by fax. The UPC number itself is referred to as the GTIN – Global Trade Item Number. The GTIN is made up of your UCC Company Prefix and the number that you have assigned to that unique product. The UCC Company Prefix is a 10, 9, 8, 7 or 6 digit number assigned to you by the Uniform Code Council. The number of digits is determined typically by how many products you will need to assign numbers to. If you have 50 products that require unique numbers, you would probably be assigned a 9 digit UCC Company Prefix (That leaves 2 digits to represent your items). In the bar code sample to the left, a 6 digit number, “012345” had been assigned. This number will represent the manufacturer on all of their products as well as in any EDI (Electronic Data Interchange) applications. The second set of numbers are used to reference the specific product. It is called an “Item Reference Number“. This number is not assigned by the Uniform Code Council. This number is up to the manufacturer and is often assigned in a random manner. In the example bar code above, the Item Reference Number is “67890”. Depending on how many items you have requested numbering for, this Item Reference Number may be 1, 2, 3, 4 or 5 digits long. This is where BaxTek Solutions can help! Tomatoes are once again implicated in a large and serious foodborne illness outbreak. To date CDC has identified hundreds of victims of Salmonella saintpaul, a somewhat unusual or rare serotype of Salmonella, and one death is suspected. Investigators are hampered by lack of traceability amongst other problems. FDA reports that investigators are encountering boxes of tomatoes without labels. Such problems make it difficult to determine safe from unsafe sources, and force FDA to only issue general information about which tomatoes are likely safe. As a result, hundreds of millions of tomatoes must be destroyed and the US tomato industry has experienced huge financial losses. This is extremely troubling at a time when food scarcities are enveloping many of the world’s poorest nations. Much of the blame for this tragic situation lies squarely with FDA’s non-existent and ineffective regulation of the produce industry. There are no laws specifically regulating how produce is grown, labled and handled. FDA has been providing guidance to the produce industry for at least 10 years but it is unknown if the industry is applying it since there are no regulatory inspections of produce safety. Florida and North Carolina are attempting to work with FDA on a state inspection program called the Tomato Initiative, but the work is very preliminary and will not be effective for years. The produce industry is filling in the gaps by self-regulation whereby growers, packers and distributors are subject to industry mandated food safety audits conducted by third party firms. The weakness in this “buyer driven” safety model is that buyers, the middlemen between the retailer and the producer, make buying decision based primarily on price and quality and do not hold food safety as their first priority. The consumer is now at the mercy of this ineffective food safety system and the produce industry is reeling from the financial effects. Lobbying by the associations representing the food industry since the mid 1990’s has kept regulatory agencies under financed and ineffective. Now that they need them, they are incapable of providing protection. It is indeed interesting to note these associations now have their own food safety schemesthat they sell to the industry as a fix for the very problem they helped create. Industry interference with regulatory efforts is to blame for the crisis state of FDA, and the produce industry is now reaping a bitter harvest of unsafe foods. Clearly the answers to unsafe foods must be found in Washington. However, with the distractions of war, inflated fuel prices and a sluggish economy (mostly caused by unregulated profiteering in the housing market) Washington is ill prepared to mount an effective food safety policy and to fix America’s neglected public health infrastructure. Consumers are losing confidence in supermarket produce and are turning to local farmers for a better quality and presumably safer product. Supermarkets will continue to suffer as consumers spend their food dollar elsewhere. Self seeking food industry leaders must blame only themselves for their tomato woes. There has been speculation about the transmission of the swine flu virus, better known as H1N1 virus, from pigs to humans during animal raising or processing and the feeling now is NO according to WHO. USDA has not issued any kind of advisory about this potential when working with pigs and this novel strain is unlikely to be transmitted this way. With that said, with pigs in Canada recently identified as infected with H1N1 it would be a possibility that if pigs were infected the virus could contaminate the meat and thus provide a means of human infection. Handling could expose workers in that event, but normal cooking would make the meat safe for the consumer. Also, this Canada event seems to be an anomaly as the pig was likely infected by a human carrying H1N1 and not the other way. At this moment it does not appear that H1N1 is moving at all through the pig population. Person to person spread is the real threat at this time. Culling herds such as in Egypt was not well-advised given that we have very scanty info that pig to human infection poses much of a risk, or any risk at all. Of course we do not know for sure what the future holds, but for now the risk is very low or non- existent for workers to become infected when in contact with pigs or from the pork supply in general. It does need close watching, however. will drive your sales and customer retention levels up — or down. your workforce and your vehicle fleet. most expensive assets — your workforce and your vehicle fleet. carrying costs for raw materials and finished goods. You have just imagined the power of field mobility. service — and overall cost-efficiency. of a disconnected field workforce? costly return trips to the office to complete a job. name, packaging type and serial number. requirements due to new government regulations. improving margins — and overall profitability. of pen and paper for these tasks created a number of issues. does not meet their day-to-day requirements. really changed the way Danka does business. equipment — and less time pushing paper. delivering over 50 flavors to 17 states. traceability — from raw materials to delivery. making a total of 8,000 monthly collections. 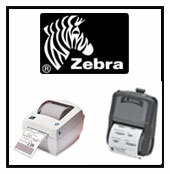 with Zebra mobile printers replaced the paper-based process. no longer need to archive paper documents. Secondly, it saves time for the customer. And thirdly, it guarantees waste traceability. rugged design required to achieve a low total cost of ownership (TCO). enables cost effective communications in the office and in hot spots. data and the completion of nearly any transaction out in the field. hours of service and arrival and departure times. 1D, 2D and direct part marks as well as documents and signatures. reach of RFID to every corner of your business. devices from a single centralized location. Services provide the day-to-day technical support you need to maximize uptime. please contact your local Motorola office or Business Partner. Specifications are subject to change without notice. Real-time mobile field service solutions help level the customer service playing field for small to mid-size organizations. In terms of fast and accurate customer service in the field, there’s one thing that most tellingly separates the small guys from the big guys: paper. For smaller companies, perhaps the biggest obstacle to better customer service and competing with the big guys is the ability to increase productivity and streamline cash flow. It’s a big challenge when your processes are largely manual. Today’s mobile technology enables the real-time, secure exchange of information between your business systems, your field teams and your customer. Perhaps the biggest benefit is that by automating manual processes through mobile devices, companies are shredding the paper issue once and for all. Today’s troubled economic climate is confronting the service industry with a number of serious business pressures. “The truth is, these challenges are neither new nor unforeseen,” says John Pomerleau, director Industry Solutions Group, Field Mobility at Motorola. For the most part, they involve issues that field service businesses have been facing for some time now. “What’s changed,” continues Pomerleau, “is the urgency with which service businesses — especially local and regional businesses — must respond to and solve them.” As the economic downturn drains profitability from virtually every service business, a premium is placed on the organization’s ability to cut costs while improving service and customer relationships. Whether you’re providing equipment or building repairs, servicing HVAC operations or delivering pizzas, customers are more demanding than ever. First of all, they want to have their call acknowledged right away, and they don’t want to just chit-chat. They want answers. They want to know the process. They want a time line. When will it be delivered? When will the repair technician be here? And why can’t it be sooner? “Second, they want the service to be at their convenience, not yours,” Pomerleau says. “The days of ‘we’ll be there between 12 and 5’ are fast disappearing.” The customer won’t be home in the morning, so the call has to be after noon, but they have to leave at two, so could you please make that between 12:00 and 12:30, thank you very much. Manual, paper-based processes are perhaps the biggest obstacle to field service efficiency and productivity. Even relatively small service companies can process half a million or more paper-based transactions every year. The sheer effort to handle so much paper is difficult, time consuming and costly. But that’s only half the problem. When technicians have to write everything down on paper, mistakes are made. Accuracy and productivity suffer. Deciphering handwriting is always a challenge and time and efficiency are lost. Data entry is delayed, ticket close-outs are delayed and therefore payments are too. Worst of all, preventable mistakes are made, placing customer relationships in jeopardy. Furthermore, according to a recent survey, 9 out of 10 technicians get lost at least once per month adding up to higher fuel costs and lost service opportunities. What‘s the answer? How do field service businesses disentangle themselves and their operations from paper-based inefficiencies and increase both technician productivity and customer service? The answer is a mobile field service solution enabled by powerful, enterprise-class mobile computers with wireless wide area network (WAN) and local area network (LAN) capabilities and integrated global positioning system (GPS), data capture and event debit/credit payment capabilities. Mobility has already proven its worth for large national and international service-based enterprises and is quickly delivering the same benefits for small to mid-size organizations. The question is: Can smaller companies afford to invest in mobility? The answer is more: “Can they afford not to?” “Historically,” Pomerleau explains, “the most significant barriers to smaller field services operations deploying mobile solutions have been cost-related.” In the past, only larger service organizations with 500 and more field personnel have been able to afford the price of entry to mobility, normally involving the purchase of a mobile platform and the development of custom applications. The cost of entry to mobility, however, is shrinking rapidly. The economics of mobility have evolved into what the industry calls the “software-to-service” model. Today, companies with as few as 30 to 50 field technicians can utilize today’s mobile technology platforms and powerful off-the-shelf software solutions for a fraction of yesterday’s investment requirements. What they get is a powerful mobile service application that helps end the paper chase by providing reliable, secure mobile connectivity to every field technician and representative on efficient, easy-to-use, ruggedized mobile devices. (As many organizations have discovered, the use of laptop computers and two-way radios cannot come close to matching the functionality, efficiency or ease-of-use of today’s mobile enterprise-class handheld devices.) And with the convergence of voice and data on a single device, and new management and security software, companies can reduce costs, protect enterprise data and ensure productivity across the entire operation. Mobility is the great equalizer. Now even smaller companies can take advantage of the extraordinary service, CRM and ROI benefits of full mobility. Access to Information. Field technicians now have instant access to a wealth of information from back room operations, allowing them to be prepared for virtually any customer service situation. On an enterprise-class mobile computer, field workers can call up the customer’s service agreement, account and service history. They can also view schematics of equipment to be repaired, with the ability to zoom in on specific components in great detail, helping them work faster and more effectively. Real-Time Communication. Real-time always-on high-speed connectivity enables faster, more accurate dispatch operations, reducing response time and enhancing customer satisfaction. It also enables more efficient and more effective field force and asset tracking. Through GPS location functionality, management can tell exactly where each vehicle is at any given time. Is it in or outside the service area? Has it been parked in one spot too long? Might the technician be having a problem? Which vehicle is closest to an emergency call from an important customer? Enhanced Data Capture. By capturing data electronically and transmitting it to operations in real-time, advanced bar code scanning functionalities can dramatically improve on manual processes by increasing accuracy, efficiency and timeliness. Image capture technology even allows the technician to photograph and document the condition of a particular piece of equipment which can be transmitted in real-time to update the customer’s records. Point-of-Sale Services. In a difficult economy, virtually nothing is more important that cash flow. Mobile field service solutions facilitate full-feature point-of-sale solutions that result in faster, more accurate billing and faster payment. Peripheral devices such as credit/debit card readers allow on-site payment (and real-time payment authorization) and the capture of the customers’ signatures while mobile printing devices can generate an on-the-spot invoice where payment can’t be collected on site, dramatically reducing days sales outstanding (DSO). Upselling. Service organizations recognize that every customer contact, even service calls, is an opportunity to increase sales. A mobile field service solution empowers technicians and representatives with access to upsell and cross-sell information. Based on first-hand observation, a cable television technician might sell a customer an enhanced cable package, or other services offered by the cable company. They can also offer special discounts or service bundles, even print out coupons for discounts on other products or services. And they can verify the sale with a customer’s signature, and even accept payment by credit card. Honeywell (NYSE: HON) announced the presence of its Scanning & Mobility business at the HIMSS09 Annual Conference & Exhibition. Honeywell is committed to providing innovative solutions that help healthcare organizations improve patient safety and reduce costs. Honeywell’s full line of bar-code scanning, mobility and data management solutions for healthcare will be on display at the booth. o 4820 – a cordless area-imager scanner purpose built for cart-on-wheels applications. o Remote MasterMind® – a browser-based enterprise-wide management solution for IT administrators seeking to manage all scanners within their network from a single remote location. o HomMed LifeStreamSM – a remote patient care system. Solutions that incorporate products from Honeywell and leading healthcare companies-Advanced Data Capture (ADC); SOTI; Cerner; Digi-Trax; JADAK; Lawson,emkat; and Surgicount Medical-will be demonstrated in the booth. Presentations on various healthcare-related topics will be led by Honeywell, ADC and Digi-Trax. Specific presentations from the Honeywell Scanning & Mobility team include: Honeywell Healthcare Portfolio; Value of 2D Bar Codes in Healthcare; and Remote Device Management. Digi-Trax will be presenting Technology Options for Color Healthcare Labeling and Wristband Printing and ADC will be presenting Good Bar Codes. Bad Bar Codes. Factors to Consider When Implementing Bar Codes into Your Hospital. The Honeywell HomMed group will be presenting information about their LifeStream Remote Patient Care home telehealth system. For complete schedule and information on additional presentations, please visit the booth. Aside from the May 11, 2009 price increase, the two most significant events this year will be the United States Postal Service’s (USPS) rollout of the Intelligent Mail barcode and extending the Move Update requirement to Standard Mail. Both of these initiatives provide opportunities for astute mailers, and increased liabilities if not fully understood. Mailers that are claiming discounts on their Standard or First Class mail pieces must have updated the names and addresses at least 95 days prior to submitting the mailing. This rule is in effect today and is directly tied to reducing the nearly 10 billion pieces of Undeliverable As Addressed (UAA) mail handled annually by the USPS. According to a UAA study conducted in 2006, the cost related to UAA mail is $2 billion with non-current addresses constituting well over 75 percent of the additional handling costs to forward, return, or dispose of the UAA mail. Because the USPS considers Move Update a requirement for any postage discounts, the penalties for noncompliance can be significant. First Class mail that is deemed noncompliant will be charged the full single-piece rate across the entire mailing. For Standard mail, the proposed penalty is seven cents per piece across the entire mailing since there is no single-piece rate. This equates to roughly $70 per thousand pieces; a significant penalty when one considers that the typical cost for updating addresses with NCOALink (an approved Move Update method) is $2 per thousand pieces. MERLIN, the Mail Evaluation Readability Lookup Instrument, is a tool the USPS uses to assist with the acceptance of business mail, including Move Update compliance. The USPS had initially targeted May 11, 2009, as the official date to leverage MERLIN as the primary adjudication device for Move Update compliance. However, that date has now been moved to January 2010 in order to determine tolerance levels for acceptance. The Intelligent Mail barcode is another major initiative that has had some changing dates. Originally planned for implementation in January 2009, the rollout of the Full Service Intelligent Mail barcode (IMBC) is now set to begin May 18, 2009. At least that is the date those mailers who wish to take advantage of the benefits of Full Service IMBC will begin testing the electronic postage payment requirement with the USPS. There are also postage discounts that will go into effect in November of 2009 for mail pieces that use the Full Service version of the Intelligent Mail barcode. First Class Mail pieces that are compliant may receive 3 tenths of a cent ($.003) and Standard mail pieces may receive one tenth of a cent ($0.001). Compared with the cost of implementing new hardware and software for supporting IMBC, these discounts seem paltry in comparison. However, the USPS is quick to point out that there are many additional benefits to IMBC. Effective May 2011, the Intelligent Mail barcode will replace Postnet as the only barcode eligible for postage discounts. Since there is no specific discount for use of the Basic Intelligent Mail barcode, it is likely that many mailers will continue to use Postnet until then. Regardless of the type of barcode used, or the Move Update method applied to names and addresses, the next several years will see numerous changes to the mailing industry. Keeping abreast of these changes will be essential for mailers who wish to continue to reap the greatest opportunities in postage discounts as well as timely and predictable mail delivery. An excellent resource for more information on Move Update and Intelligent mail is the newly designed USPS RIBBS web page (http://ribbs.usps.gov). Mailers should also continue to work closely with their software and hardware providers and work collaboratively with their local USPS business mail acceptance office and mail piece design analysts. The USPS will likely implement temporary postage discounts for high-volume mailers who schedule drops between June 15 and Sept. 15. While the details of the program are still being worked out, discounts are expected to be between 20 percent and 30 percent. If the program is implemented, discount levels will be based on mailers’ meeting individually calculated levels based on the volume of mail they sent out between June 15 and Sept. 15, 2008. Because of the manpower needed to calculate each level and discount, the sale may apply to only the 4,000 largest Standard Mail class users, according to a Direct Marketing Association (DMA) statement speculating on the discount program. Fort Mill, S.C. – December 2, 2009 – Honeywell (NYSE: HON) today announced that Sydion, LCC, a mobile crisis management technology company, is offering its’ patient-tracking software on Honeywell’s mobility platform to assist in the administration of the H1N1 vaccine. The system that Sydion is offering bundles Honeywell’s Dolphin® 9900 mobile computers into Sydion’s eMET®, an emergency patient tracking system, to deliver a complete offering that enables healthcare providers to effectively prepare for and manage mass H1N1 vaccine administration at locations such as hospitals, vaccination clinics or schools. Recently made available to the public, the H1N1 vaccine is in extremely high demand due to several outbreaks of the H1N1 flu, commonly known as the “swine flu.” The mobile tracking system offered by Sydion enables healthcare facilities and public health agencies to address the public need by offering a system to track, monitor and administer available vaccines either remotely or on-site. With eMET®, patients are provided with a bar-coded wrist band or other form of identification that includes vital information which is used to create an electronic medical record. The patient ID is entered into the eMET® central database, creating a way for medical personnel to track and prioritize all patients, based on individual needs. The system automatically transmits all patient data scanned or entered into the mobile computer to the patient’s record in the eMET® database, ensuring that physicians have up-to-date information and can follow up with the patient as needed. The wireless technology and rugged design of Honeywell’s Dolphin mobile computers gives the units flexibility for use in environments such as schools, offices, and indoor or outdoor locations. With this mobility, healthy patients no longer need to sit in a waiting area with sick patients, as healthcare personnel are able to travel outside of their offices to administer the vaccine. This eliminates exposing healthy patients to the illness, and enables providers to effectively immunize patients while largely reducing transmission of the virus. For environments that may require a higher level of infection control, eMET® is available with Honeywell’s Dolphin 9900hc mobile computer. The Dolphin 9900hc is equipped with disinfectant-ready housing and is built to withstand frequent cleaning with harsh chemicals. This product allows for maximum cleanliness in any environment, helping to minimize the spread of germs from patient to patient. “With such a prominent healthcare concern rising around the world, Honeywell is pleased that Sydion selected its Dolphin 9900 mobile computer to be a part of their eMET® offering that allows healthcare facilities to manage the process of H1N1 vaccinations,” said John Waldron, Vice President of Worldwide Marketing, Honeywell Scanning & Mobility. “Through its relationship with Sydion, Honeywell is delivering on its commitment to provide devices that are being used to address the healthcare concerns of today by helping to ensure medical accuracy and increase patient safety. Hotels throughout the world have begun to use RFID technology for a variety of different functions such as uniform tracking and keyless entry. Now, there’s also a company called Linentracker that offers RFID systems to take inventory of towels and sheets, allowing hotels to be more efficient with their laundering processes. Linentracker uses EPC Gen 2 inlays and is based on passive, ultrahigh-frequency (UHF tags and readers that comply with the EPC Gen 2 standards With the Linentracker system, the hotel can access real-time inventory levels of its linens throughout the hotel, all while optimizing linen laundering processes. The system works by mounting RFID readers to the inside of hotel linen closets, which are located of every floor, in addition to various places throughout the laundry room. RFID tags are attached to each and every piece of linen, ranging from towels, to sheets to pillowcases. The RFID tags, which are sewn into the seam of each linen, are sealed within a flexible, waterproof material specifically engineered to protect the tag from extreme temperatures and shock. Since many hotels still perform manual inventory counts of their linens, the Linentracker would ultimately save hotel staff a lot of time, which in turn, would save the hotels money. With Linentracker, each linen closet’s inventory can be tracked remotely in real-time. In addition, the Linentracker can create instructions to tell workers how much of the dirty laundry they will need to clean in order to meet the demands for the following day, which ultimately reduces energy and water usage. In addition to creating a more efficient workflow, the Linentracker is able to prevent thefts of both staff and guests. While Linentracker is still in a pilot program, I imagine it will become a high demand for hotels around the world. Linentracker is another example of RFID technology being put to good use, ultimately enabling the spread and usage of RFID. WASHINGTON — Federal agencies that supply food for 31 million schoolchildren fail to ensure that tainted products are pulled quickly from cafeterias, a federal audit obtained by USA TODAY finds. The delays raise the risk of children being sickened by contaminated food, according to the audit by Congress’ Government Accountability Office. In recent recalls, including one this year in which salmonella-infected peanut butter sickened almost 700 people, the government failed to disseminate “timely and complete notification about suspect food products provided to schools through the federal commodities program,” the audit says. The audit focuses on the Food and Nutrition Service, or FNS, an arm of the Department of Agriculture that provides states and school systems with federally purchased commodities for school lunch and breakfast programs. The agency lacks systems to ensure that it is notified when the Food and Drug Administration begins a food-safety investigation that may lead to a recall, the audit says. Then, instead of determining in advance whether a suspect product was sent to schools — and advising those schools not to serve the food while the investigation is underway — the service sometimes doesn’t begin that process until a recall announcement is made. “Further actions must be taken to strengthen the communications, planning and procedures needed to prevent recalled or contaminated foods from entering (school) cafeterias,” Rep. George Miller, D-Calif., who chairs the Committee on Education and Labor, said of the findings. Auditors cited the recalls of 4,000 products containing peanuts from the Peanut Corp. of America. After salmonella was traced to the Georgia plant, the FDA announced a limited recall of products made there during a specific period. But the Food and Nutrition Service determined that its purchases from the plant were not made during that time and said on its website that schools weren’t affected. Not until six days later, after the recall was expanded to cover products made on other dates, did the service tell schools to pull all the plant’s products. As a result, the audit says, some of the 226 students who got diarrhea and other salmonella-related symptoms “may have consumed the (tainted) products in school.” About 46 were hospitalized. Agriculture Secretary Tom Vilsack says in a written response to the audit that ensuring the safety of school meals is of “utmost importance” and the department is developing a formal system to get advance notice when FDA is investigating food-safety concerns that could lead to recalls. He also promised new policies and guidelines to improve communication with states and schools. “It is absolutely essential that food recalls affecting schools are carried out quickly and effectively because children are most vulnerable to becoming seriously ill from food-borne illness outbreaks,” says Rep. Rosa DeLauro, D-Conn., who chairs the House Approprations subcommittee on agriculture. Problem: Benefits of recycling is understood, accessible, but not practiced. Americans recycle about a quarter of their residential trash – a rate that has remained fairly constant despite the growth of curbside recycling service, community education and other efforts to encourage more recycling. Research suggests behavior is not changing because of the extra effort involved to recycle and the lack of perceived benefits. So, Rewards for Recycling in Davison, Michigan decided to provide motivation and remove practical obstacles to recycling in their community just north of Detroit. Rewards for Recycling developed a system that used Web-based memberships and an RFID system to easily and automatically track residents’ recycling activity. The program provides Metalcraft’s RFID labels to each residence which are placed on their curbside recycling bin. The labels have a unique account ID number corresponding to the address, and the community’s waste haulers carry RFID readers either in their vests or mounted on the trucks which automatically read the labels without burdening their work. Rewards for Recycling also secured the participation of local businesses to provide coupons, giveaways and other money-saving certificates to residents’ recycling. Each time the household recycles, they are awarded credit to their RewardsForRecycling.com account which can be redeemed for items and offers from local businesses. Davison, Grand Blanc, and Genesee Townships were the first of three communities to use the program in Genesse County where residential recycling rates range from 8 to 22 percent of households. In just one month, the number households recycling shot up 50 percent, and the volume of recycling more than tripled. The RFID-enabled program generates foot traffic for local businesses and thousands of savings certificates were downloaded from rewardsforrecycling.com in the first month. With a proven concept, Rewards for Recycling has their eyes on expansion. Just 18 percent of Michigan households recycle statewide. And Hards is eager to serve multiple types of communities including universities, large condo and apartment complexes in addition to residential neighborhoods.